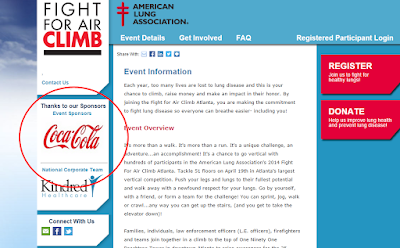 Weighty Matters: Do You Think the American Lung Association Would Mind Tobacco Sponsorships? Do You Think the American Lung Association Would Mind Tobacco Sponsorships? I mean let's say for a moment that the American Diabetes Association decided to launch a fundraiser and they took money from Philip Morris, Altria, Reynolds American, Inc. and Imperial Tobacco. I'm pretty sure they'd get some flak for that, and probably some directly from the American Lung Association (ALA). 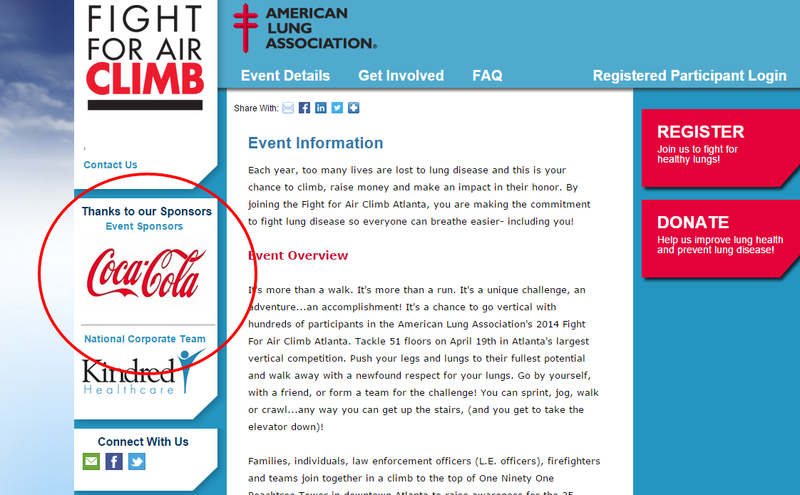 Coming from the American Lung Association however, it'd be rather hypocritical flak. "one of the American Lung Association's signature fundraising events. With events in more than 65 cities, participants young and old climb to raise funds in support of the mission of the American Lung Association: to save lives by improving lung health and preventing lung disease." Some of the event's sponsors? I know the food industry's money's as green as everyone else's, but clearly, as we've seen with tobacco, lines can be drawn regarding whether or not the means justify the ends.